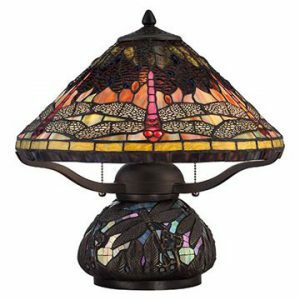 Tiffany-style lighting refers to stain ed lead glass lamps that were originally designed in the late 1800’s by Louis Comfort Tiffany at the height of the Art Nouveau movement in design. He was the son of Charles Lewis Tiffany who founded the prestigious New York jewelry firm Tiffany & Co. The young Tiffany began as a painter, but became interested in glassmaking in 1875. After working for several years as an interior designer, Tiffany returned to glassmaking in 1885 establishing the first Tiffany Glass Company. Interestingly, Tiffany built quite a reputation as an interior designer remodeling the Mark Twain House in Hartford, CT in 1881 and several rooms in the White House in 1882. Being inspired by works he saw at the 1889 Paris Exposition, Louis built a new factory in 1893 and began making the now famous Tiffany style glass lamp. At its peak, the plant had more 300 artisans led by designer Clara Driscoll. Tiffany developed the copper foil method. The desired lamp pattern is first drawn on heavy cardboard. A color glass piece is then traced on the cardboard and labeled with a color name. After cutting the glass and polishing it, a copper foil i s applied to the edges to adhere the pieces together. The edges are then soldered and the lamp is cleaned. 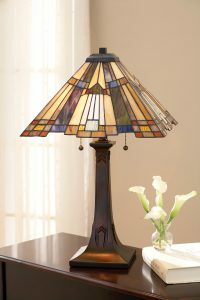 Modern art glass manufacturers continue to craft lamps in Tiffany’s tradition, inspired by the craftsmanship of the original productions of Louis Comfort Tiffany. True to his Art Nouveau roots, Tiffany used nature as his primary source of design inspiration with his detailed floral designs his most popular. 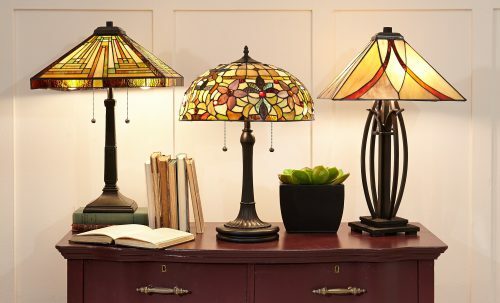 Due to the weight of the glass shades, the bases of Tiffany lamps were originally created in cast bronze and followed the botanical theme of the shade. Numbered original Tiffany lamps have sold for thousands and are cherished by collectors and lovers of Art Nouveau design. 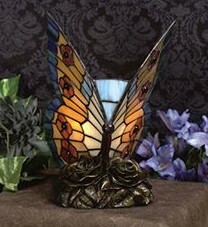 Tiffany-style lamps remain popular today because of their stained-glass like beauty and craftsmanship. Van Dyke’s Restorers has added the Quoizel Collection of Tiffany style lamps and will be adding more lines in coming weeks. Choose from traditional floral designs, Mission-style designs, geometric patterns, whimsical dragonflies, frogs, turtles, fish, butterfly-shaped accent lights, and more. 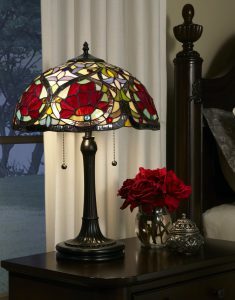 We have table lamps, floor lamps, pendant lights, desk lights, and specialty lighting with Tiffany-style shades.